Is Andy Roddick still a contender in tennis? You are here: Home / Pro Players / The beginning of the end of an era? The beginning of the end of an era? I feel like this has been a long time coming…the decline of the American favorite, Andy Roddick. He’s not entirely out yet, but I feel like everybody is “holding” their breath for him to announce that he’s hanging up his tennis racquets and move onto life after the tour. For the last year or so, Roddick has been on a steady decline in the rankings, not major drops or anything, but just enough to slowly fade away and let the young guns take the American spotlight (i.e. Ryan Harrison, John Isner, and the returning star Sam Querrey). If you look at his current ranking, he’s nestled at #34 (as of 3/19/2012) where he hasn’t been since July 16, 2001. That’s a heck of a long time to be away from that ranking. 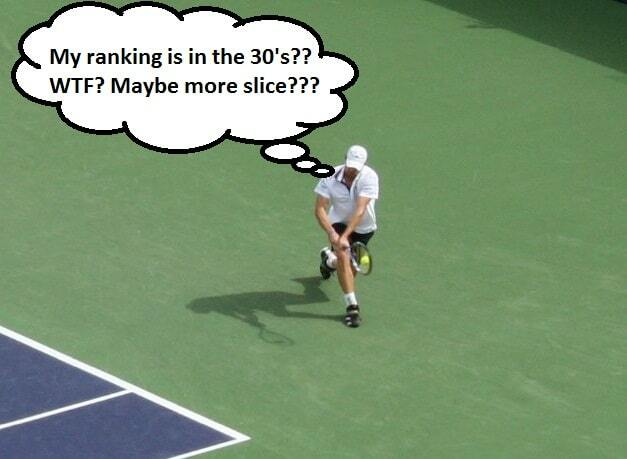 What is causing the dearly beloved Andy Roddick to slip in the rankings? He has to be in good shape, he is after all a professional athlete; so it can’t be health…or is it? Over the last two or three years, I have observed Andy slow down on the court significantly, to the point that he’s let more than enough tennis balls pass him by during a point. If you look at his game, we can all see it, the slice backhand; it makes me sick watching 70% of Roddick’s backhand strokes are being sliced…a stroke that takes far less energy to hit than a full backhand. I have also noticed that Roddicks’ first serve has dropped MPH (or KPH for those of you who use the metric system) roughly 15% less than what he was serving up a few years back. Perhaps all the travel, and the miles he’s put on his body are starting to wear on him? You have to think about all the times Roddick has had to play a tournament, only to hop on a plane the day after and fly across the country, or globe for another tournament; only to have to do that again and again for the last 15 years (juniors, ITF, and ATP), how many flights is that? Even I get burnt after taking a flight that’s a few hours long, I could not imagine the stress the body takes when travelling so much. Also, with all those tournaments he’s played, how many miles on court has he put in, just during actual match play? Let’s also count the off court training and on court practice he has to put in – the 2012 Australian Open final between Rafael Nadal and Novak Djokovic, each player ran around 5 miles in that match alone. At what point does the body give in? There has to be parts of Roddick’s build that starting to give way to the accumulation of his career. The other bummer is that many players on the tour have dialed in how to beat Roddick, or let him self-implode and lose. Especially his kryptonite, Roger Federer. Roger has been the thorn in Andy’s side since, well since the beginning of their professional careers (circa 2001). I’m starting to think that of the 26 times Andy and Roger have met, Roddick’s 2 wins have not done much for his confidence against the Swiss maestro. Even now with Roddicks’ lower ranking, Andy will meet his nemesis earlier in tournaments – case in point: Roddick vs. Federer in third round at 2012 Sony Ericsson Open. Now comes the big question; is Andy Roddick relevant to tennis anymore? The simple answer is no; however, he is still relevant in the sense he has been bridging the gap of young American players and previous generations of American tennis. Especially with Ryan Harrison, in a way showing Harrison the ropes of the tour and even giving him pointers for his tennis game. There is absolutely nothing wrong with that; he has done a lot for the sport, showing the world what tennis players are capable of with his incredibly fast serves. Furthermore, Roddick has always worn his emotions on his sleeve, breaking tennis racquets; yelling at umpires, showing frustration, and giving some of the better post match press conferences. Is all this to say that Andy Roddick is fading away? That’s ultimately up to him, he is the one that decides his fate in tennis. Though, considering him a contender to win a major or even a master 1000 are rather far fetched. The spark he had, you know, the explosive player who lived for the intensity of a heated tennis match seems to have disappeared. Now it seems like he’s out there just going through the motions until he either loses or finds a way to win. I’m personally quite tired of ‘hoping’ he’ll win at the majors only to be let down. It’s like every year, I think he’s going to retire or even more unlikely, pull an easy draw; but that’s not ever the case. Every year, I watch Roddick get so close and then something sets him off and his game goes straight down the drain, and a little piece of me goes down with it. We all know it, most of us don’t want to accept it, but the truth is, Andy Roddick’s era is ending. At least we have Harrison and Isner to replace him.